Feb. 14 of each year, the world celebrates Valentine's Day. Today, this American celebration has become more globalized. As more people communicate via the Internet, watch satellite channels, or travel frequently, ideas become rapidly widespread in the Arab world. People around the world react differently to this special occasion. They express their affection, care and appreciation for others in their own, culturally-acceptable ways. How is St Valentine celebrated in Arab countries? In Morocco St Valentine is special. When you go down town, you see hundreds of teenagers buying St Valentine gifts sold in most shopping malls in Rabat, Morocco's capital. Morocco's new generation is more influenced today than its precedents by foreign cultures, traditions, and celebrations. However, Morocco's old generation is more reluctant to change, and preserve its own values and traditions. We can say that not a great majority of Moroccans celebrate Valentine; some do not even know it; others neglect it or simply don't believe in it. In Saudi Arabia, accepting the St Valentine occasion seems to be difficult. Saudi Arabia's morality police are on the scent of illicit red roses as part of a clampdown on would-be St Valentine's lovers in the strict Muslim kingdom. The Committee for the Promotion of Virtue and Prevention of Vice, Saudi Arabia's powerful religious vigilantes, have banned shops from selling any red flowers in the run-up to February 14. Florists say the move is part of an annual campaign by the committee, whose members are known as volunteers, to prevent Saudis marking a festival they believe flouts their austere doctrine of "Wahhabi" Islam. In Iraq, Valentine's Day has never been widely celebrated. Some Iraqis eye it suspiciously; others say it's inappropriate or a violation of conservative Islamic values or that it simply is not possible to find an appropriate place to steal a romantic moment. Isolated corners, largely out of sight, are too dangerous. Crowded cafes are far safer, if less romantic. And in a time when Islamic extremists are fighting alongside loyalists of former dictator Saddam Hussein, public displays of affection are risky. 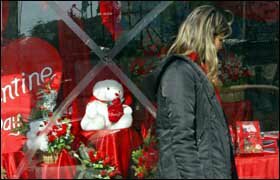 In Lebanon, this year's St Valentine was bloody, as a huge car bomb killed Lebanon's former Prime Minister Rafik al-Hariri and at least 12 other people in Beirut's most devastating attack since the 1975-90 civil war. A weekend before Valentine's Day, jihadist souls were not questioning the “commercialization” of romance, but inquiring about the ban on “being in love.” The “scholars” said human love is evil. The simple feeling of being attracted to or in love with someone is a terrifying sin if it is committed outside of their religious dogma, and it warrants serious punishment. There are varying opinions as to the origin of Valentine's Day. Some experts state that it originated from St. Valentine, a Roman who was martyred for refusing to give up Christianity. He died on February 14, 269 A.D., the same day that had been devoted to love lotteries. Legend also says that St. Valentine left a farewell note for the jailer's daughter, who had become his friend, and signed it "From Your Valentine". Other aspects of the story say that Saint Valentine served as a priest at the temple during the reign of Emperor Claudius. Claudius then had Valentine jailed for defying him. In 496 A.D. Pope Gelasius set aside February 14 to honour St. Valentine. Gradually, February 14 became the date for exchanging love messages and St. Valentine became the patron saint of lovers. The date was marked by sending poems and simple gifts such as flowers. There was often a social gathering or a ball. In the United States, Miss Esther Howland is given credit for sending the first valentine cards. Commercial valentines were introduced in the 1800's and now the date is very commercialised. The town of Loveland, Colorado, does a large post office business around February 14. The spirit of good continues as valentines are sent out with sentimental verses and children exchange valentine cards at school.